Dr Conway is currently working, with Computer Science colleagues, on tracing extremist networks on Twitter; developing an ontology of violent online political extremist material (Onto-X); and content and sentiment analysing the contributions to a major extreme Right online forum. She is the Principal Investigator on a EU Framework Programme 7 (FP7) Network of Excellence in violent online political extremism, entitled VOX-Pol, launched in January 2014. On the strength of her research and publication in the area of terrorism and the Internet, a topic on which she has published over 25 papers, Dr Conway has also taken-up over 40 guest speaker invitations, including at the United Nations in New York, the Commission of the European Union in Brussels, the Royal United Services Institute (RUSI) in London, the Irish Military College at the Curragh, the Danish Institute of International Affairs in Copenhagen, and elsewhere. She has participated in two Ditchley Foundation meetings. Dr Conway serves as an editorial board member for the journals Media, War, & Conflict and Irish Studies in International Affairs. In addition to her position as Vice-Chair of the International Affairs Committee of the Royal Irish Academy, is a past-Chair (2011 – 2012) of the International Studies Association’s (ISA) International Communication Section. 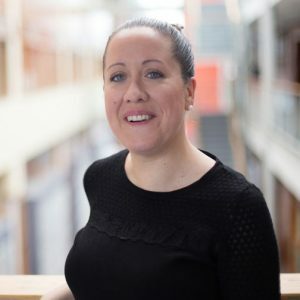 Prior to her post at DCU, Dr Conway was a Teaching Fellow in the School of International Relations at the University of St. Andrews, Scotland; she has also been Visiting Professor in the Centre for Contemporary Middle East Studies at the University of Southern Denmark.